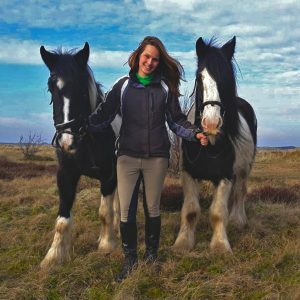 Which are the faces behind Rijstal Le Cheval? Hereby we would like to introduce ourselves. We are Doeke and Agnes. We met in 2009 when Agnes did seasonal work at the beach pavilion in Ballum. Doeke was born and raised on Ameland. Soon we became a couple. 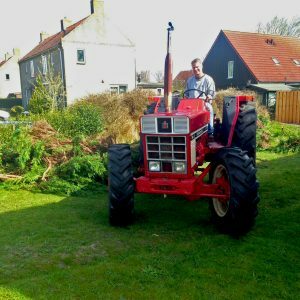 Shortly after Agnes finished studying in Groningen in 2016, she moved to Ameland. You will regularly find Agnes in the stables. She is mainly concerned with the horses. Doeke is mainly engaged in all work around the stable, such as work on land and various chores. Rijstal Le Cheval has been an important part of Doeke’s family for years. Three aunts have set up the stable. One of them, Ineke, has continued the stable for over 40 years with great enthusiasm. Gradually the stable grew into what it is today. Since September 2017 we are the proud owners. Ineke is also still regularly at the stable. 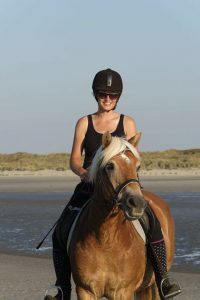 With pleasure we bring together our passions for horses (Agnes) and working on the land (Doeke) in the riding stable. We like to share our passion with others. In doing this, we find it the most important thing that people have fun. Because horse riding has to be fun in the first place. We therefore attach great value to a friendly and cozy atmosphere. Our small scale is essential in this, so that we can give everyone the necessary attention and guidance.